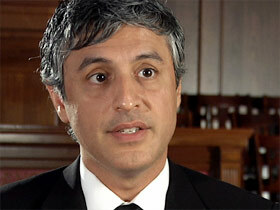 KIM LAWTON, correspondent: Bestselling author Reza Aslan claims he didn’t set out to challenge anyone’s faith in Jesus Christ. 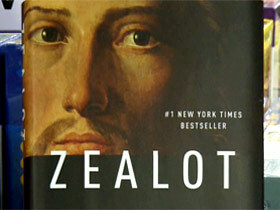 He says the intention of his provocative book Zealot: The Life and Times of Jesus of Nazareth, was to explore who Jesus was, apart from what theology and tradition have said. 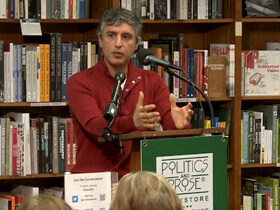 REZA ASLAN (Author, Zealot): This attempt to dig through as much as possible the layers of legend and mythology, of interpretation and faith that have arisen around Jesus the Christ, and to get to Jesus the man, is I think important, not just for the historian but I think also for the person of faith. LAWTON: Many believers have been offended at Aslan’s portrait of Jesus as a zealous revolutionary who ultimately failed at his mission to liberate the Jews from Roman occupation. Aslan says the historical context can’t be ignored. ASLAN: The foundation of Christianity is that Jesus is both fully God and fully man. Well, if that is true, then to really understand who the fully man part was, you have to understand the world in which he lived, because that world affected who he was. LAWTON: Aslan has a Ph.D. in the sociology of religion and teaches creative writing at the University of California, Riverside. He is a practicing Muslim, who also wrote No god but God, a bestselling book about Islam. In Zealot, Aslan describes being a 15-year-old immigrant from Iran and attending an evangelical youth camp in California where Jesus was hailed as the savior. ASLAN: (in talk) I immediately gave my life to Jesus, had a deep encounter with Christ, spent the next four or five years preaching the Gospel as I had learned it from this very conservative evangelical community, preaching it to everyone whether they wanted to hear it or not, frankly. LAWTON: But then, Aslan says, studying religion at university disillusioned him, and he left Christianity. ASLAN: When I went to university and began studying the New Testament in an academic environment and discovered immediately as everyone who does so discovers, that far from being literal and inerrant, the Scriptures are figurative and full of the most obvious and blatant errors and contradictions, that notion of Evangelical Christianity no longer made sense to me. LAWTON: Aslan’s book places Jesus in a long line of nationalists and would-be messiahs who wanted to end Roman oppression and establish the kingdom of God on earth. ASLAN: There were many zealots in Jesus’ time. It was a phenomenon that was quite widespread, and that led to a number of rebellions and insurgencies throughout the first century. And the argument of the book is that those zealot ideals and principles are at the heart of Jesus’ teachings and actions. LAWTON: In one particularly disputed assertion, Aslan suggests Jesus may have sanctioned violence to throw off Roman occupation. ASLAN: Jesus understood that the kingdom of God, the removal of the Roman Empire could not be done except through force. And so, I think that the general impression of Jesus as some kind of pacifistic preacher of good works with no interest in the cares of this world is incomplete at best. LAWTON: He describes Jesus as an illiterate peasant who took on the political and religious establishment. ASLAN: His message was extraordinary, this notion of the reversal of the social order, that the first shall become last and the last shall become first, that the rich will be made poor and the poor will be made rich, the hungry fed and the fed go hungry, this was, as you can imagine, an enormously appealing message for the hungry and the poor, and it was an enormously threatening message for the well-fed and the wealthy. LAWTON: He says Jesus’ death by crucifixion proves the authorities saw him as a revolutionary. 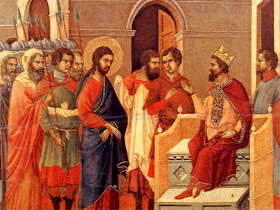 And after the crucifixion and the destruction of the Jewish Temple, Aslan contends that Jesus’s followers began redefining his message, assigning him spiritual, not political, intentions. ASLAN: And so begins this attempt to temper Jesus’ revolutionary impulse as much as possible, to claim that the kingdom of God that he espoused was not an earthly kingdom but a heavenly kingdom. It made this message far more appealing to Romans and indeed paved the way for the Roman adoption of Christianity and began the process of utterly divorcing Christianity from its parent religion, Judaism. LAWTON: Zealot has generated controversy on multiple fronts. The search for the historical Jesus has been going on for decades, and many say Aslan contributed nothing new. ASLAN: My attempt wasn’t necessarily to blaze new ground in the study of the historical Jesus; at this point, frankly, there isn’t all that much new to say. But my attempt was to make that research appealing and accessible to a broad, general audience. LAWTON: There have been questions about Aslan’s qualifications for writing the book. Some prominent scholars say his work contains errors, and they dispute his conclusions. ASLAN: Wow, newsflash: scholars disagree! There are ten thousand different arguments about the historical Jesus in the scholarly world. And ten thousand refutations of them. I think that for the non-scholar, the non-academic, it might come as a shock or be somewhat newsworthy that there are scholars who disagree with my scholarly analysis. But amongst we scholars, that’s called Thursday. LAWTON: Some readers take issue with how Aslan uses New Testament passages to validate his assertions at certain points, but then appears to dismiss the Bible when it doesn’t backup his thesis. He concedes that looking at history can never fully answer questions about Jesus. ASLAN: Is it possible that unlike 98% of his fellow Jews, he could read and write? Yes, it’s possible, but it’s not very likely. Is it possible that he was born of a virgin and that he was resurrected again? Yes, it’s possible. But it’s not very likely. And the historian is interested in not what is possible, but what is likely. LAWTON: In the end, Christians will likely still rely on faith, but Aslan says even as a Muslim, he found himself profoundly drawn to the Jesus of his research. ASLAN: That man that seems so much more real to me than the sort of celestial spirit that I, I was taught in church, that’s a man that I want to follow. That’s a man that I want to be like. How to confront powers, how to stand up for social justice. I learned all that from the historical Jesus, not from the Christ of faith. A new book by religion scholar Reza Aslan portrays Jesus as a Jewish revolutionary and just one of many in a line of “failed messiahs.” “It was a phenomenon quite widespread that led to a number of rebellions and insurgencies throughout the first century,” says Aslan.